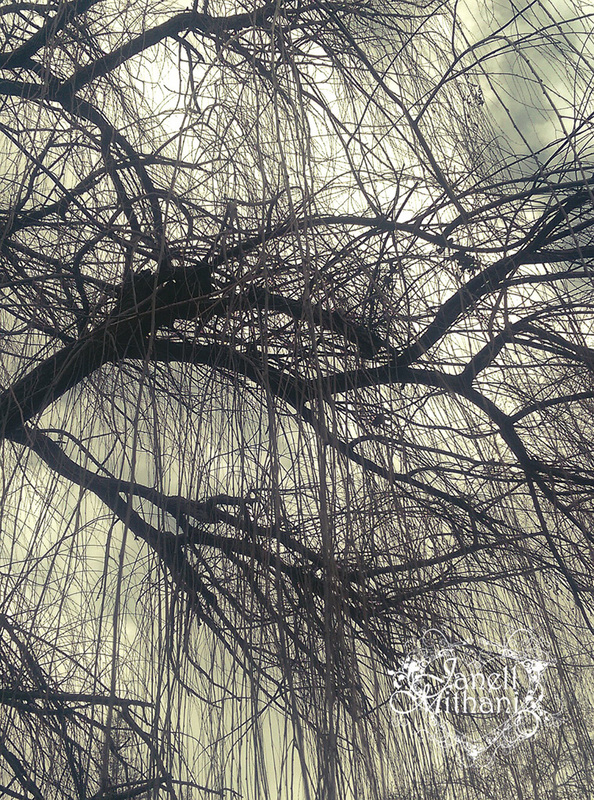 While at Descanso Gardens a few weeks ago, I walked under this willow tree and was surrounded by lines and contrast. As I slowly turned in a circle while looking up, It made me think about how lines create form and interest, inspiring me to explore lines in different ways when I paint. When I sketch, I am very conscious of line, but when I move to the medium of paint, I find that I think in terms of color and shape. My first thoughts are towards my liner brush, (one of my most favorite tools,) but I want to look at new ways to emphasize line. I am going to see how I can use some of my other brushes in a different manner to create “lines” in my next painting. It’s amazing how nature inspires us in so many different ways! This entry was posted in Art and tagged art, drawing, line, nature, painting. Bookmark the permalink. Wow, Janell, your photo is breathtaking! It certainly is inspiring. Thanks for sharing. Thanks, Jill. It was an amazing tree. yes, such an amazing tree, and such an amazing photo! Thanks! Cnawan. I enjoyed reading your blog. Love the shot and what a great tree! Inspiration can come in many forms and shapes and I’m looking forward to see how you will translate your inspiration unto the canvass! Lovely post! Thanks, Eva. Have a great day! Beautiful photo! We all need to look up more. It is amazing how nature inspires us. I can see how when seeing something like this tree you think in terms of lines, but when looking at a flat piece of paper or canvas your brain thinks differently, such as in color instead. Something to think about for sure. Thank you are sharing your photo along with your thoughts! Lovely. Interesting. I love my liner brush too, but I’d never thought about lines and the way the add shape and form. Beautiful tree and I love the shot you captured, Janell. One of my favorite trees. What an awesome photograph Janell, but it’s because you absorbed your surroundings. So glad you looked up, your creativity is incredible. Mary, you are always so thoughtful with your comments, Thanks so much! I imagine when the leaves are on that tree it’s even more beautiful! I love the lines and tones in this image! Amazing how nature inspires us in so many ways. Thanks, Suzy. It was a great tree. Nature inspires us in many ways.